"Dust In The Wind AKA Dusty, pictured at a year old, is bred and owned by Dakota Winds Ranch. 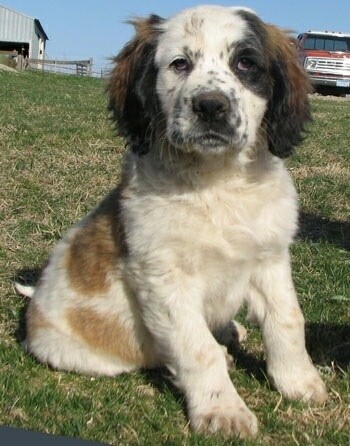 He is 25% Saint Bernard, 37.5% Cocker Spaniel, 25% English Shepherd and 12.5% Pekingese." The Nehi Saint Bernard has the look of the original Saint Bernard, but is much smaller, dry mouthed, without overly saggy eyes. 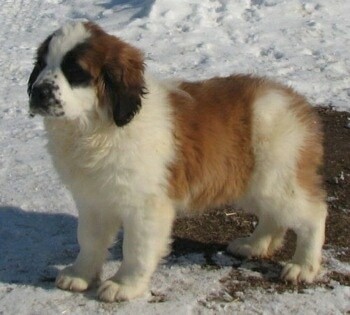 It is a shedding breed, but much lower shedding than the original Saint Bernard. It has heavy, thick bones, giving the appearance of a very stocky dog, with a wide head and large ears that are not overly long. The muzzle is short and stout, without being pointy. The coat may be from a smooth, shorter haired, to a longer, fluffy look, with or without waves. Some may have some loose curls, but never tightly curled. Colors are the typical various shades of brown, with white markings, in either the splash or mantle color, with a black mask. Also the unique red and white coloring, with a darker red mask. Other colors, such as black and white, black, tan and white, and cream and white can be registered as breeding stock or pet quality only. The Nehi Saint Bernard was bred to be a more house-worthy dog for Saint Bernard lovers that simply cannot have or handle such a large dog. Or for those wanting a healthier version. 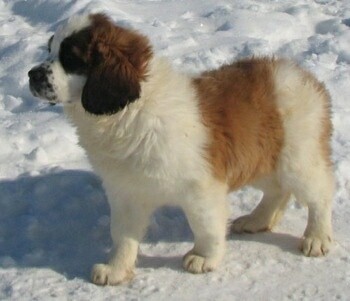 Many love the look, temperament and majesty of the Saint Bernard! However, more and more families cannot handle such a large breed, or do not live in an area to have such a large dog. Others simply cannot live with so much drooling inside of their homes. Still others just want a longer lifespan for their beloved pet. 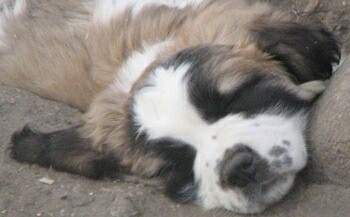 The Nehi Saint Bernard is a very calm, loving, gentle breed. At play, they often use their front feet, rather than their mouths. They tend to have a special fondness for children. They have a love of toys and a love to be with their people. They often are good watchdogs, barking to let their owners know, but are not guard dogs. Not an aggressive breed. 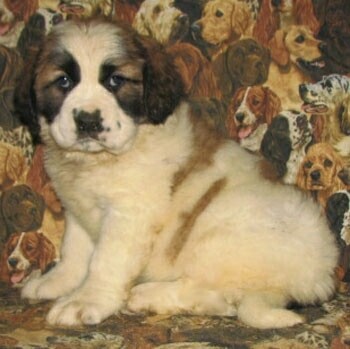 Nehi Saint Bernards are very easy to train when started at a young age, and some have been known to be fully housetrained as young as 7 weeks old. It is best to begin training as soon as you bring your new puppy home. They can be trained at an older age, but will take more time and patience. Socialization at a young age is also important. To bring out the best in any dog it is wise to understand dog behavior in order to properly communicate with your dog. 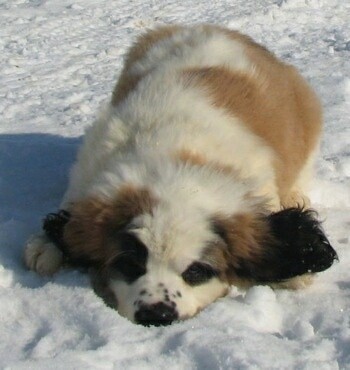 Owners who keep the dog well balanced will have a Nehi Saint Bernard who does not tend to run off, even when allowed loose, seeing its owners as the leaders of the pack. 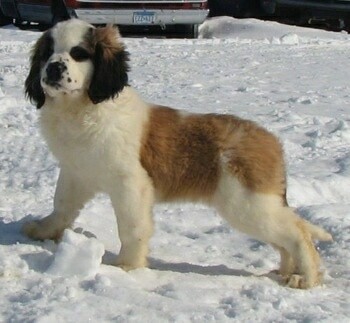 Nehi Saint Bernards get their name because most mature around knee high, but with the look of the Saint Bernard. They stand from 15 to 21 inches tall, and weigh from 35 to 80 pounds. Most average 17 to 19 inches tall and 40 to 60 pounds, being very well-boned, stocky dogs. Nehi Saint Bernards have fewer health problems and a much longer lifespan than the original Saint Bernards, usually living into their mid-teens. They may have minor health issues, such as umbilical hernias, usually caused by the mothers pulling too hard on the cord at birth, and rarely cherry eye. They have very good hips, often lying with their back feet behind them, and are not known to have issues with cancer or other diseases. 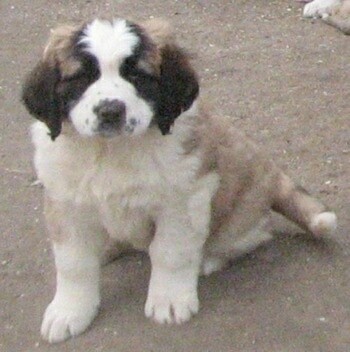 Nehi Saint Bernards will do okay in an apartment if they are adequately exercised, and are fairly active indoors. A small yard is sufficient. Not suited to live outside alone in a kennel. 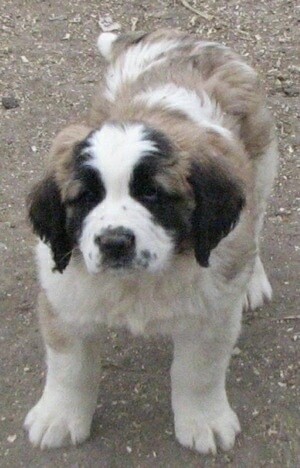 Nehi Saint Bernards have plenty of stamina and need regular exercise. They should be taken on daily, long walks. When walking, be sure to have the dog heeling beside or behind the person holding the lead, as in a dog's mind, the leader leads the way, and that leader needs to be the human, not the dog. 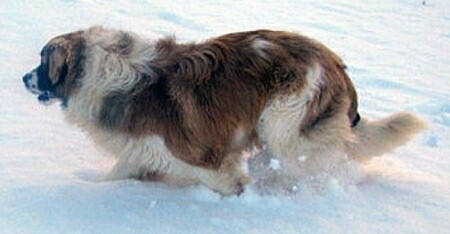 The Nehi Saint Bernard is a breed in development. 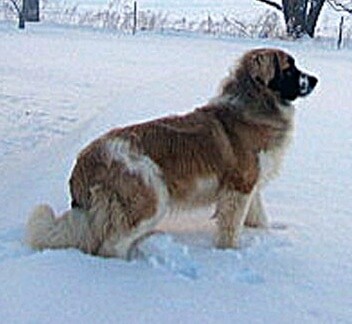 Breeds used include 37.5% Saint Bernard, 25 to 37.5% Cocker Spaniel, 12.5 to 25% English Shepherd, up to 12.5% Ori Pei and/or up to 6.25% Pekingese. 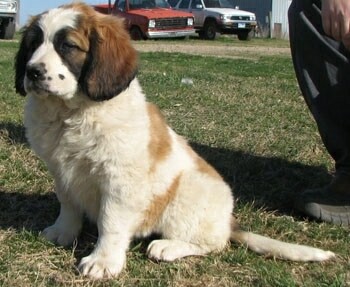 All Nehi Saints must be within this range of Saint Bernard, Cocker Spaniel and English Shepherd. They also must have at least this small percentage of either Ori Pei or Pekingese or both. 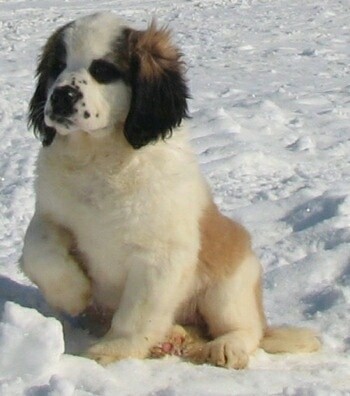 As a new breed, bred from using several other breeds, dogs that are 25% to 50% Saint Bernard, with 25% to 50% Cocker Spaniel, with or without the 1 or more of the other 3 breeds, can be registered as breeding stock or pet quality only. 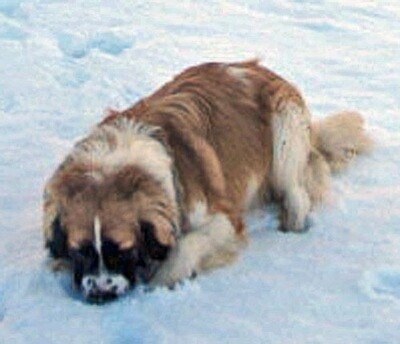 Not all Nehi Saint Bernards have Pekingese in them. "Dust In The Wind AKA Dusty, pictured at a year old, is bred and owned by Dakota Winds Ranch. 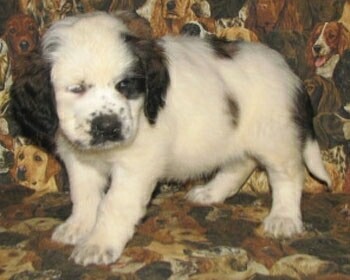 He is 25% Saint Bernard, 37.5% Cocker Spaniel, 25% English Shepherd and 12.5% Pekingese. " 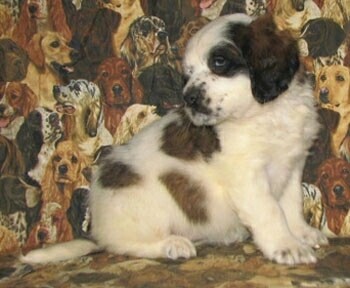 "These are our Mini Saint Bernards, or as we call them, Nehi Saint Bernards. (They mature knee high.) This is Brute Force AKA Brutes, pictured at 3 months old. He is a keeper, future sire for us (Dakota Winds Ranch) Also bred by us! 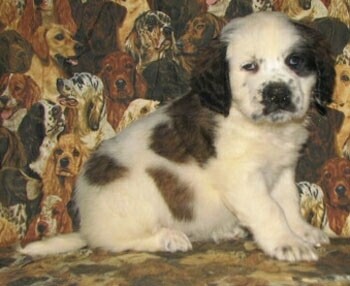 Brutes is actually 37.5% Saint Bernard. He is also 25% Cocker Spaniel, 25% English Shepherd and 12.5% Ori Pei. He is very calm/mellow, extremely gentle, sweet and loving! He will mature around knee high."